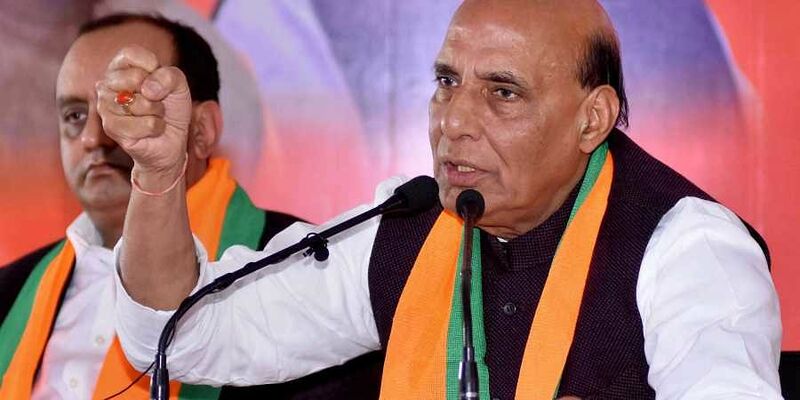 The Union Home Minister also asserted there have not been any major terrorist-related incident in the country in over four years of the Narendra Modi-led NDA government. JAIPUR: Home Minister Rajnath Singh Sunday said Pakistan can seek India's help if it cannot handle the fight against terrorism alone. He asserted there have not been any major terrorist-related incident in the country in over four years of the Narendra Modi-led NDA government. "I want to ask the Pakistani prime minister (Imran Khan) that if in Afghanistan, a fight can be carried out against terror and Taliban with the help of the US, then, Pakistan can seek help against terrorism from India if it feels that it cannot handle it alone," he said. Addressing a press conference here, Singh said Jammu and Kashmir was not an issue as it was an integral part of the country. "The issue is of terrorism, and Pakistan can discuss it," Singh said. The Home Minister also accused the Congress of creating a crisis of distrust in politics and claimed there was a difference in their words and deeds. "I do not want to claim that terrorism has stopped, but no major terrorist incident has happened in the country in last four-and-a-half years," he said. Terrorism is confined only to Kashmir where also situation is improving, Singh said adding Panchayat elections in J&K is being conducted successfully. "The government has brought Jammu and Kashmir into political process. As far as terrorism is concerned, there is no second thought that it is Pakistan sponsored," the Home Minister said. The Union minister asserted that the country and its borders are safe. Terrorism has reduced and the problem of Naxalism will get eliminated from the country in the coming years, he added. Naxal related incidents have come down by 50-60 per cent in the last four years, he said, adding it has reduced from 90 districts to only 8-9 districts and that the problem will get eliminated in next three to five years.